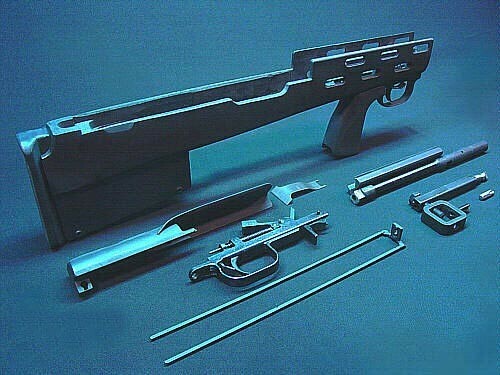 HITECH BULLPUP SYSTEM: Total drop in assembly time on HITCH Bullpup Stock “ready to fire” is less than three minutes! We have three prices on the HITECH Bullpup System: Price 1 is 875.00 (with all options as shown above) This includes: HITECH Bullpup drop in stock with completely ready to use internal fire control system with forward trigger system. All built like a tank and handles like an F18 fighter jet! ............................................... 375.00 * 1 HITECH 37 Rd Mag ..................................................... 85.00 * 1 HITECH 20 Rd Mag ..................................................... 85.00 1 HITECH Bullpup shell deflector duct cover ............................ 125.00 * 1 HITECH Shock Wave Muzzle Brake....................................... 65.00 1 HITECH adjustable all steel folding bipod ............................ 43.00 1 HITECH vented all steel gas tube and Picatinny (Weaver) mount......... 125.00 * 1 HITECH 4 Point Tactical Mount - for Red Dot and laser units .......... 90.00 1 HITECH Tactical Red Dot – with 10 different dot intensity settings ... 95.00 1 HITECH Tactical Laser – over 500 yards in darkness ................... 65.00 1 HITECH Competition trigger group used with fire control system ....... 225.00 1 HITECH Vedio Instructions on CD (included in package)................. 0.00 * Total Price if purchased separately .... 1,378.00 Total Discounted Price as package ...... 875.00 Price 2 is 585.00 (includes everything above marked with asterisks) Price 3 is 500.00 (includes everything above marked with asterisks except mag) California version uses standard 10 round mag so Price 1 (with all options)less two mags is 705.00 and the system uses your standard 10 round box magazine. Description of Price 1: (with all options as shown above): The Bullpup is a custom kit and is available through our Custom Shop at a total cost of 875.00 which includes everything you see on the images above except the rifle. Tweaked and tricked out for speed of handling, perfect function and reliability! We also include all items listed above: Shock Wave Muzzle Brake, bipod, extra mag, (two mags) and red dot optical unit show on our webpage including the laser system. All pre tested on a live fire rifle at our Custom Shop location before we send you the drop in Bullpup System. We also supply video instructions on a CD that covers installation. Very simple to install as the Bullpub System comes completely assembled, live fire tested, and ready to install onto your rifle! 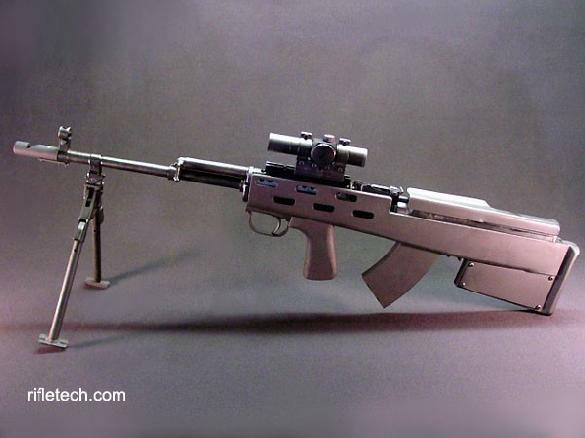 (completely drop in design) We must also know what type of SKS you have so we can build it to that rifle. Is it Russian, Chinese, Romanian, or Yugoslavia? If you don't know give us a call and we will help you identify the origin of it. Total drop in assembly time on HITCH Bullpup Stock “ready to fire” is less than three minutes! Description of Price 2: (without options but includes one mag): Without the optional items the cost of the Bullpup kit completely ready to install onto your rifle is 585.00 (You must send us your trigger group) All pre tested on a live fire rifle at our Custom Shop before we send you the drop in Bullpup stock package completely preassemble at our factory and tested. 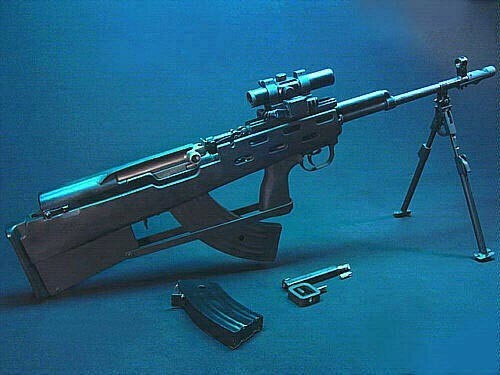 Description of Price 3: Same as Description of Price 2 but you supply the mags and the cost is 500.00 Turn around for the complete Bullpup System is currently 2 to 3 weeks - from deposit ($100.00) to final balance charged to you account 1 day before shipping from our company to your location. The main mechanical parts of kit (riflestock installed with our dynamic fire control system (dual trigger unit) The Bullpup comes pre assembled as one unit and is fully functioning as one unit – right out of the box! It is very straight forward and simple to install onto your rifle. Under three minutes with no disassembly of our Bullpub unit except 3 screws. We also give you phone support at any time if needed. As an option you can send your rifle and our Custom Shop can assemble the system for you. The charge for this service is 75.00 (which is our minimum for Custom Rifle Shop service) and would include live fire zero in on the red dot mags and laser. Shipping back to you would be 35.00 with insurance. If you plan on shipping your rifle to our Custom Shop you must call ahead and make the proper arrangements with us to get your rifle to our Custom Shop. Do not send your rifle unless you call first! Please call 1 (248) 382-1211 and ask for Phil, Chris, or Tim. They are the answer egg heads around here and the application experts! Very easy to talk to - so call.